The Buffalo Sabres’ problems don’t seem to be going away. They are merely evolving. Now the issue has become putting the puck into the net even once per game. Buffalo didn’t do that at all on Tuesday night before an announced crowd of 17,569 in the KeyBank Center. The result was very predictable – a 2-0 defeat at the hands of the Tampa Bay Lightning. If that goose egg sounds familiar, it’s because it is. The Sabres were blanked in a similar way on Saturday night when they were beaten in Montreal. That means Buffalo hasn’t scored in slightly more than 120 minutes, and that can cause some strain. And it’s showing. It was the first time since October 2014 that a Buffalo team had been kept off the scoreboard in back-to-back games. While the Sabres have had trouble scoring goals through the season, they hadn’t been completely blanked until these two losses. The Sabres fell to 1-6-2 in their last nine games – and have scored a total of 17 goals in that span. That works out to less than two goals per game. Tuesday’s game was a matchup of the team that’s leading the Eastern Conference – the Lightning improved to 17-5-2 this season – against the team that’s at the bottom of it. Tampa Bay certainly had moments where it played like one of the top-scoring teams in the league. At one point, the Lightning skated down the ice on a three-man rush, and must have put together five or six good passes in advancing the puck. It looked like a three-man weave from a high school basketball practice. But all that skill, while frequently fun to watch, didn’t result in any goals. Tampa Bay’s scores both came on shots from the defensemen that bounced off a Sabre and found the net. Those grubby goals count just as much as the ones on the highlight shows. “Two shots off our own skates or sticks – that’s hockey,” Kane said. 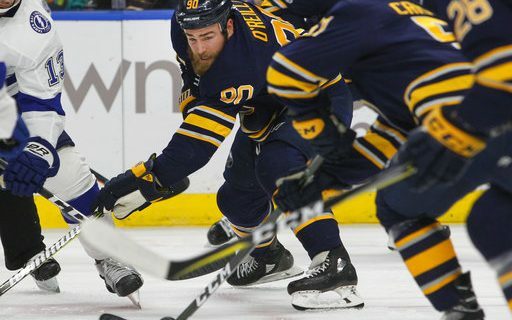 The Sabres are off until Friday night, when they host the Pittsburgh Penguins. Buffalo scored four goals the last time the two teams met (Nov. 14, a 5-4 overtime loss). A repeat performance would be embraced, but anything in the net would be a step in the right direction. What is truly baffling on this team is lack of anger or fire displayed by highly-paid players who aren’t “playing to their handicap”. Almost at the cap, this team is performing at “TANK” levels. Guessing Botts and Phil have been more than patient, but this just isn’t working.